1. DOES BNB CHAT COLLECT OR SAVE ANY PERSONAL DATA FROM HOSTS OR USERS? When you register with BnB Chat, you are required to provide us with your email address and unique password. We require no additional information from you and we are not engaged in any online merchant transactions or property management. Companies like Airbnb, VRBO, HomeAway, and FlipKey that collect your personal data must respond to hundreds of subpoenas from private and governmental agencies each year. Please keep in mind, whenever you give any of your personal information to any company, you must consider that data as public record because no company can guarantee 100% data security. 2. DOES YOUR COMPANY REPORT ANY TAX INFORMATION TO THE CITY, STATE OR FEDERAL TAX AUTHORITIES? No. We have no reason to collect your social security number or personal bank account information and never need to mail you a 1099 Tax Form or report any of your rental income to any city, state or federal tax authority. 3. WHAT ARE THE BEST SIZES FOR MY PROPERTY PROFILE IMAGES AND MY HEADSHOT IMAGE? If you're shooting images of your property with a mobile phone, hold the phone in landscape mode and our software will do the rest. 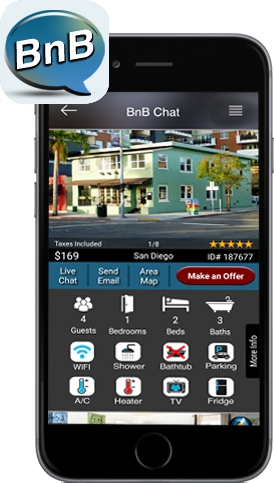 If you would prefer to edit your images on your home computer prior to submitting them to BnB Chat, please crop each image to 600 pixels wide by 400 pixels high at 72 pixels per inch for best results. If you're shooting your headshot image with a mobile phone, hold the phone in portrait mode and our software will do the rest. If you would prefer to edit your headshot on your computer prior to submitting it to BnB Chat, crop the image to 125 pixels wide by 150 pixels high at 72 pixels per inch for best results. 4. WHAT IS FEDERAL PREEMPTION? "In the law of the United States, federal preemption is the invalidation of a U.S. state or local municipality law that conflicts with Federal law." This doctrine is based on the Supremacy Clause of the United States Constitution. With the enactment of Internal Revenue Code ("I.R.C.") 208A by Congress in 1976, state and local municipalities are preempted from enacting laws and ordinances that are in conflict with Federal law. If you live in Santa Monica, Manhattan Beach or West Hollywood, CA or any other municipality in the United States that has passed unconstitutional laws or ordinances prohibiting the rental of a primary dwelling for 14 days or less during the taxable year, you may want to discuss I.R.C. 280A and the "de minimis" rule with an attorney. If your attorney is a avid golfer, he might know this law as the Master's Exemption. It's a constitutional right afforded every American for the past 40-years.